As prepartions are made for the 75th anniversary of the D-Day landings that fateful June 6, 1944 another crucial event took place 70 years ago this April. On April 4, 1949 a collection of 12 nations began the North Atlantic Treaty Organization (NATO) designed to counter Soviet Communist infiltration and aggression in Western Europe. The United States entered its forst peacetime allaince since 1777. It had emerged as the world’s strongest military and economic power. America possessed the most atomic bombs and about 60% of the world’s gold supply after functioning as “the arsenal of democracy” in World War Two. American leadership put together a world system by the late 1940s that is still operative, even under signs of strain. As late as June, 2017 tiny Montenegro became NATO’s newest member and Russian moves into the Crimea and eastern Ukraine have shown the alliance may be relevant for quite some time in spite of pressnt strains and stresses. Threats from Russia, Iran and a wave of ambitious terrorist groups – NATO troops fought in Afghanistan – shows the alliance can operate well beyond the North Atlantic region. It seems like a good time to tell again the story of those early years. Winston Churchill gave his "Iron Curtain" speech in Fulton, Missouri in 1946. The rejoicing and euphoria at the defeat of the Axis powers in 1945 ushered in springtime of glorious hope. Surely the United Nations Organization, then being formed in San Francisco, would succeed where the old League of Nations had failed. After all, didn’t the Anglo-Americans and their Russian allies possess the military power to smother aggression anywhere on the planet? Most were unaware of the intense jockeying among the war-time powers to control the post-war settlement. Russian troops occupied northern Iran. Greece and Turkey’s communist parties were practicing subversion. In Europe the Soviet Union– bleeding from 20 million casualties in the war – was not about to vacate countries such as Poland, root cause of the conflict in the first place. “The accidental President” Harry S. Truman in the White House was increasingly frustrated with Stalinist intransigence and overt designs on Greece and Turkey. He sent U.S. warships to the Eastern Mediterranean, pushed for a U.N. Resolution (No. 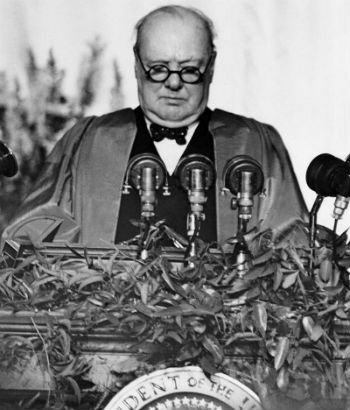 2) to get the Soviets out of Iran and called in former British leader Winston Churchill to sound the alarm with his “Iron Curtain” speech at Fulton, Missouri in 1946. Churchill painted a bleak picture, envisaging a long struggle to counter Soviet designs on the most strategic zone for America and Britain – Northwestern Europe. Even young Congressman Richard Nixon of California felt Churchill was too alarmist, but he was soon to change his mind. America’s economic strength undergirded the Marshall Plan. Luckily for the West, the foundations of American post-war leadership had already been laid during World War Two. The World Trade Organization and the International Monetary Fund, implemented as early as 1944 to guard against the kind of sharp depression that followed the end of World War One. The United States would exchange dollars at the rate of $35 an ounce, an arrangement that lasted until 1971. America’s economic strength undergirded the Marshall Plan, whereby the United States Treasury guaranteed the rebuilding of Western Europe’s economic infrastructure with as much 17 billion dollars in overseas credits. Even the Soviets were offered Marshall Plan dollars but coldly refused. Stalin was more interested in harassing the British, French and American occupation forces in Germany. On June 24, 1948 the Soviets cut off electricity and rail traffic to West Berlin, 150 miles behind the Soviet lines. On April 4, 1949 a collection of 12 nations began the North Atlantic Treaty Organization (NATO). The response was brilliant, starting with the British RAF – “Operation Vittles,” the Berlin Airlift, saw 4500 tons a day of supplies flown in to isolated West Berlin by December, 1948 and 81,000 tons a day by spring, 1949. More vital goods were arriving than before the Soviet blockade! On May 12, 1949 the Russians climbed down. What historian Paul Johnson called “the first, large-scale formal confrontation of the Cold War” had ended in a brilliant propaganda victory for the Anglo-American coalition. Hard-edged power politics lay behind this American reshaping of the postwar world. During the Berlin blockade Truman had sent three B-29 squadrons to Germany. He was furious to learn the U.S. had materials for only twelve atom-bombs, none of which were ready for shipment. 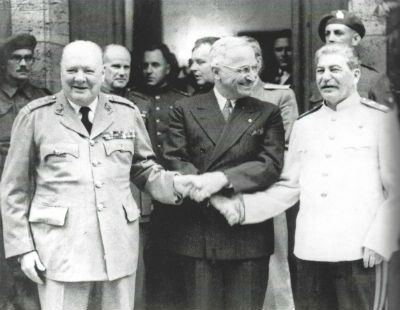 But Truman knew Stalin did not know that. The cat-and-mouse game we call the Cold War was off and running by 1948 (LaFeber, page 77). America’s hard-nosed realism came in the nick of time. In 1949 war-time ally Nationalist Chinese fell to Communism. The explosion of a Soviet A-bomb in 1949 threw an ominous new light on world affairs. An anti-Communist witch hunt ensued in the United States which has still left scars. The years 1944 to 1949 were thus a decisive period in world history. Beneath the hue and cry the foundations of a stable world order were steadily being laid. And in the middle of all this the United States found time to recognize the state of Israel in 1948 and desegregate the armed forces the same year. The world we now recognize was very much in place less than 5 years after September 2, 1945. Scares there still were when the Cold War turned hot in Korea in 1950 but the system held fast. Efforts in Korea were not in vain. For one thing tiny South Korea hosts the largest Christian congregation in the world. In Tokyo, General MacArthur’s wise stewardship had already turned Japan – the real prize in the Pacific – into a key American ally. That alliance still holds. By those standards the United States qualified as a true superpower, and still does.